Sacramento is ready for a new season -- not just a weather change -- but a new season of TEDxSacramento events! The first TEDxSacramento Salon event of the 2014/2015 season, entitled “This Changes Everything: Seeds of Change,” took place in the company of more than 600 attendees who spent hours together laughing, sharing and listening to the many speakers, presenters and artists at the Wells Fargo Pavilion on September 26, 2014. 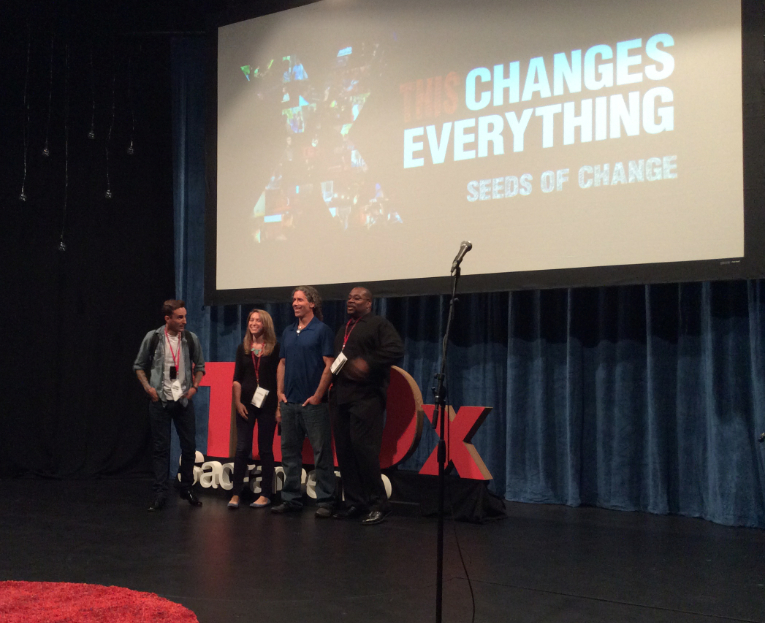 TEDxSacramento speakers (from left to right: Phil America, Emily Castor, Andrew Markell, and Dr. BJ Davis) gather for a group photo before the "Seeds of Change" event on September 26, 2014 at the Wells Fargo Pavilion. The performers were invited to speak based on their continual efforts to challenge and reimagine the world we live in today. In conjunction with the theme “Seeds of Change,” they offered the audience views and perspectives to spark new ways of thinking, speaking and living in our community. Some offered life lessons from personal experiences in prison, living in slums both domestically and internationally, studying with Tibetan monks, and trying their hand at entrepreneurism while others offered inspiration through song and movement. Attendee, Jo Dharshana Balchandra, joined her friends for the night with much enthusiasm stating, "This was the first TEDx event I've been to. It was inspiring to hear the speakers' transformational stories which impacted their lives and their community." This salon event is only the beginning! There are two more events planned for the 2014/2015 season with the next event taking place December 2014! Take advantage of these community events – fully-planned and coordinated independently for a localized TED-like experience in the Capital Region. We can’t wait to see you there! Thank you to the following individuals for their performances at the "Seeds of Change" event: Phil America, Be Brave Bold Robot, Emily Castor, Dr. BJ Davis, Joe Kye and the Sacramento Black Art of Dance, and Andrew Markell. The following TEDTalks were also featured: “The Voices in My Head” by Eleanor Longden, “How Not to be Ignorant about the World” by Hans and Ola Rosling, and “Get Ready for Hybrid Thinking” by Ray Kurzweil.